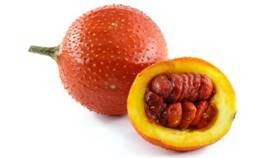 Gac fruit oil with high contents of Vitamin A and Vitamin E is also known as baby jackfruit and sweet gourd, the bright red spiny fruit about the size of a cantaloupe is bursting with powerful antioxidants such as beta carotene and lycopene to boost the immune system and slow down the symptoms of aging. Gac fruit oil is especially rich in vitamin. Xeoxanthins and alpha-tocopherol are anti- radicals free and forms of vitamin E contained in the oil. GAC FRUIT OIL is recommended for: - skin care: creams, milks, soaps like Anti-Aging, Anti radio free, after sun protection of skin, regenerate. Storage: Store at 40 °C in tightly sealed original containers. Avoid prolonged exposure to light, heat and air. Shelf Life: 24 months in original unopened packaging in cold and dark place. Safety: Refer to MSDS. Not considered hazardous.